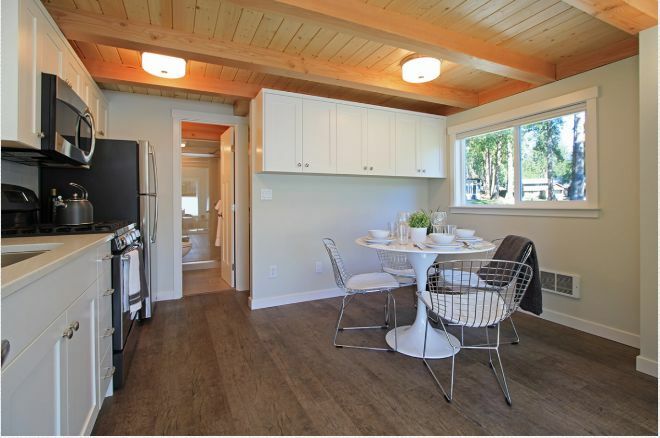 If staying in 400 square-feet of living space sounds a little cramped, you have to check out this model which feels elegant and roomy despite its small size! 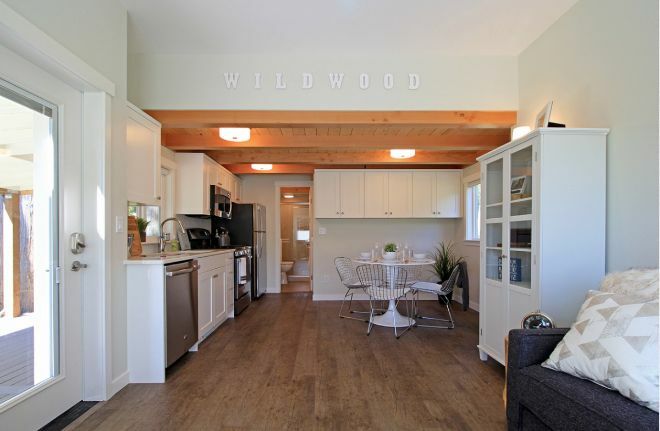 Located in the Wildwood Lakefront Cottage resort, the elegant home packs a lot of punch for a tiny home! The large, covered front porch is a perfect place to sit and enjoy a picnic or play a few games with family and friends. 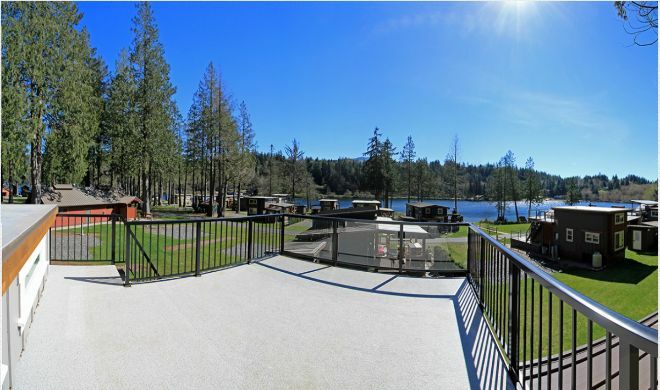 With quick access to the lake and outdoor activities, the vacation home provides a great way to get your family back to nature. 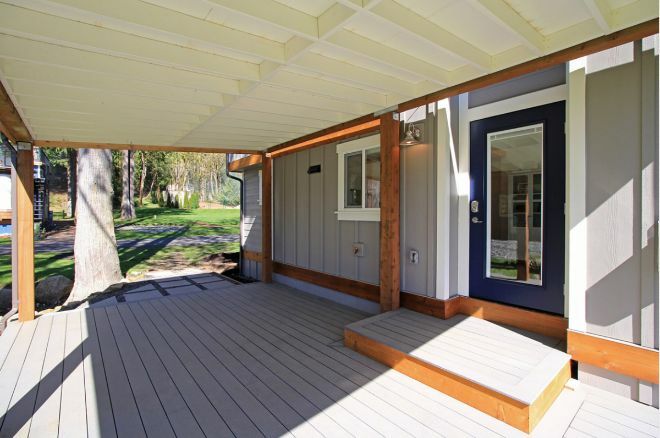 When you step inside, you'll be surprised at how spacious the tiny home feels. An open-concept living space opens into the full kitchen, so family and can talk and laugh while dinner is in the oven. Large, bright windows help the room feel even bigger. 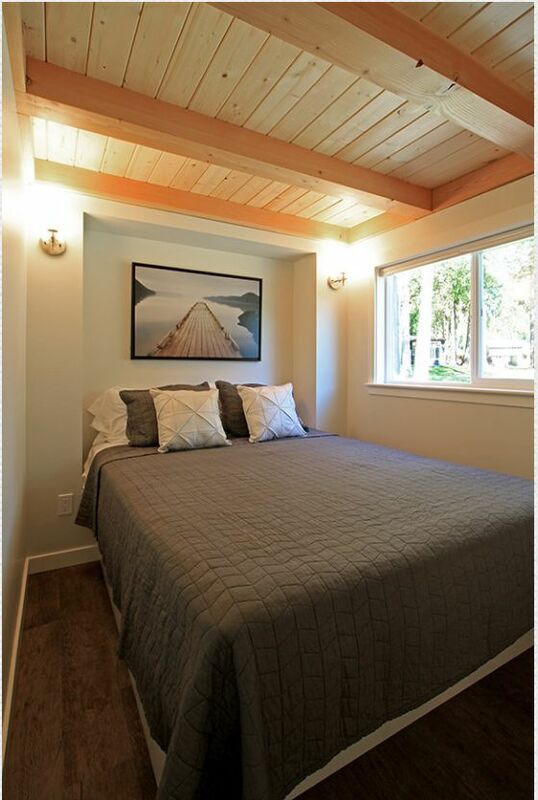 Check out the fantastic wood floors and the feature ceiling! With plenty of storage and elegant design, this home feels more like a luxury hotel than an affordable, tiny home. 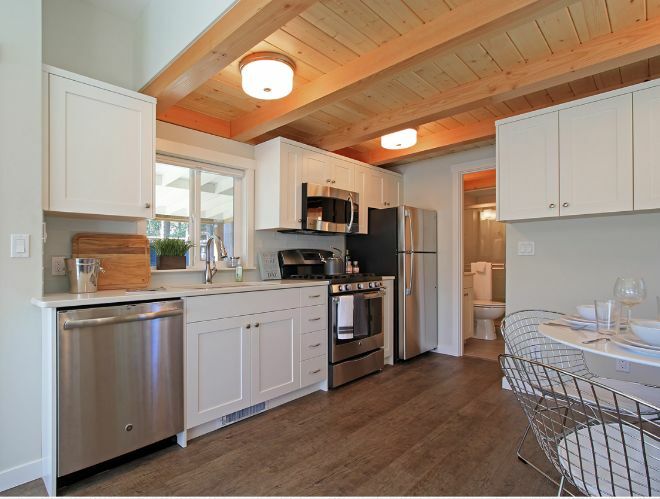 The hardwood floors carry throughout the entire home. The plank ceilings cover the back area of the home. 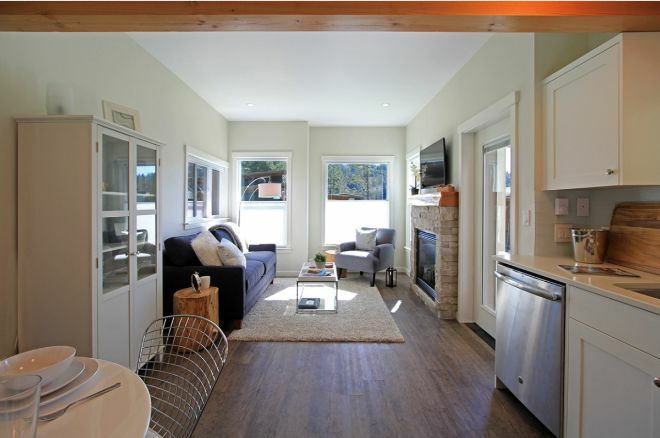 The kitchen/dining area is fully stocked with a dishwasher, stove, full-sized refrigerator and microwave. The open space makes it easy to dine with the whole family. We really love the high cupboards, so you can make use of the extra floor space underneath. One of the selling features of this home is the vast amount of windows, which offer plenty of natural light and help the home feel less cramped. The cool ceiling feature carries into the modern bathroom. 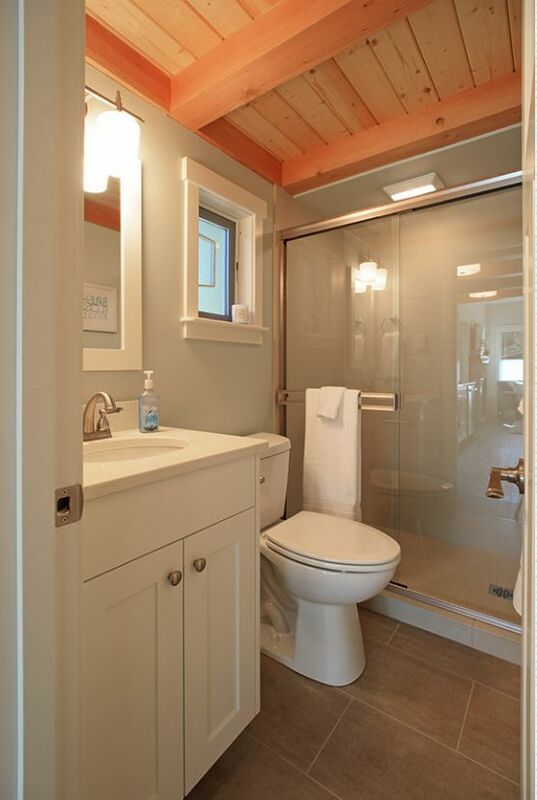 In a 400-square-foot home, you'd think the bathroom would get the shaft. But, this full-sized room offers plenty of space to get ready, and the shower, too, is "surprisingly roomy," as West Coast Homes' description puts it! The main bedroom is located on the first floor. While there's not much wiggle room here, it still manages to feel modern and luxurious. The loft area of the home features two separate rooms. You can use them for additional sleeping space, office space or entertainment space. The loft area is a great way to get more breathing room when everyone is indoors at night. 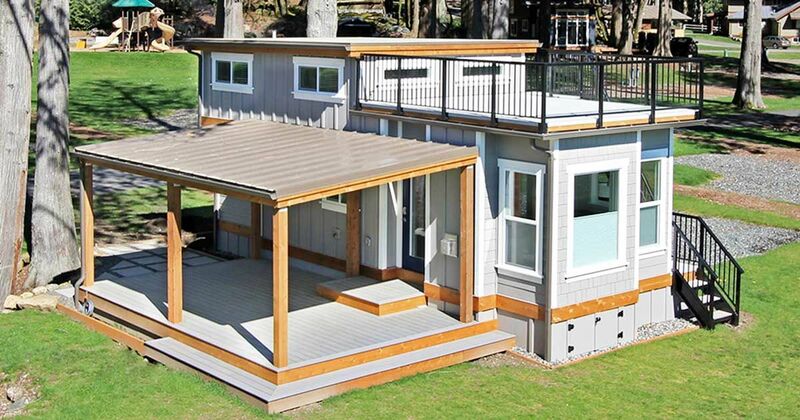 If the comfy interior isn't enough, the large upper floor deck may tip the scales. Get fantastic views from outside, as well as plenty of entertainment space, perfect for a summer barbecue or a morning cup of coffee. 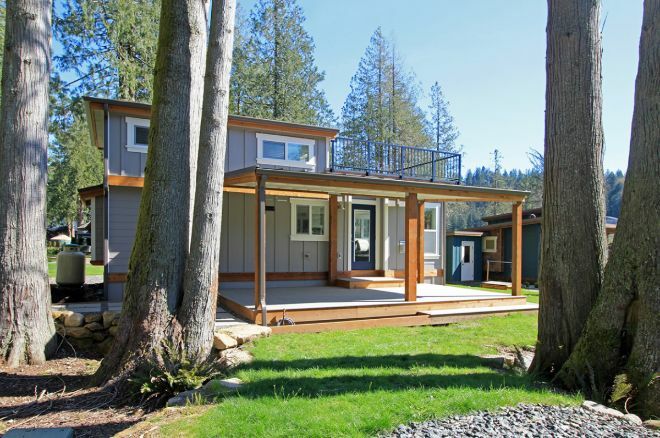 This home is part of a group of resort cabins located right on a freshwater lake. The properties include onsight management and access to various amenities including a tennis court, pool, clubhouse, and playground. What did you think of this spectacular park model? Share your thoughts in the comments section. 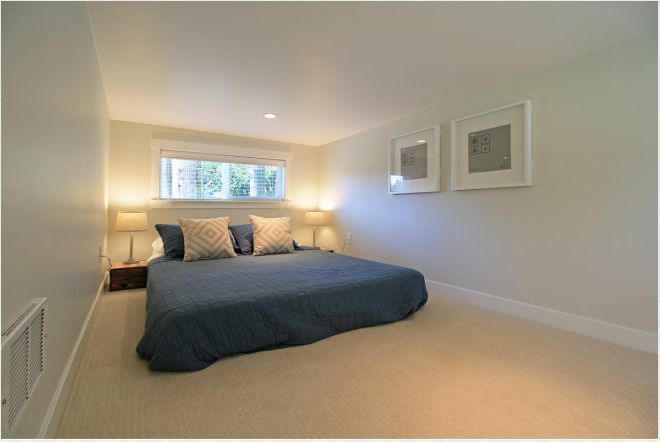 Step inside and see the extra bonus room that will dazzle you with its generous square footage. The bathroom layout is nothing short of genius. Why didn't we think of that? Vacation on the wild side with a park model centered in the midst of an untamed forest. This iconic Airstream makes for a vacation you won't forget. It has everything one might need: sleeping arrangements for four, a spacious kitchen and updated bathroom.